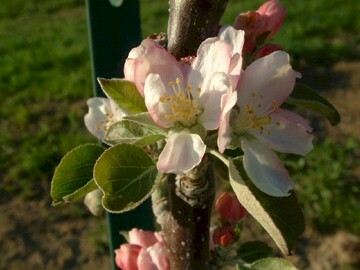 A classic English cider apple which actually originated in Boisguillaume, France in the 1800’s. It was introduced into England in 1884 by the Woolhope Naturalists’ Field Club where it was embraced for its outstanding cider qualities. 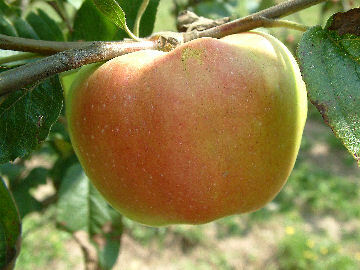 It is a bittersweet fruit which produces a sweet, astringent juice high in tannins and converts into a cider with high alcohol content and a strong, fruity flavor. Fruit is orange and yellow in color with a light russet coating. Ripens in November. Is Medaille d’Or ripe in November in your area? Or earlier? I just planted it in eastern Washington state and hope our drier climate, in which temps fluctuate 30 degrees daily, may bump it up a little. Then again, it is supposed to bloom pretty late — am curious to see how it performs. How does it do for you?